In Hydromagic, alarms can be configured to alert you, or stop recording a sounding, when specified conditions are (not) met. 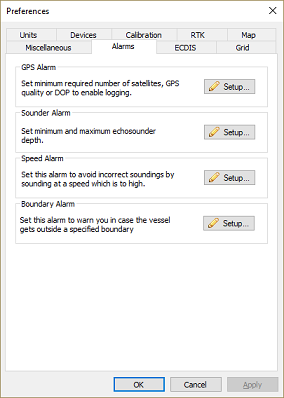 Alarms can be applied to GPS accuracy, position, speed, echo sounder depth and boundary (geofencing). We recommend you to use at least the alarm for the GPS accuracy to avoid recording invalid data for hours. For instance. when the RTK fix has been lost, you want to know this immediately to avoid recoding with invalid tide values. To setup alarms, first select the "Preferences..." item from the "Options" menu to open the preferences dialog. To setup alarms on the GPS / RTK equipment, click the "Setup..." button in the "GPS Alarm" section. 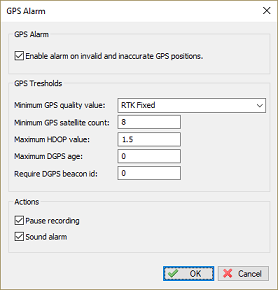 To enable alarms for GPS, check the "Enable alarm on invalid and inaccurate GPS positions" option. When using tide corrections using RTK, it is recommended to use this option with "RTK Fixed" selected, so you will be notified when RTK tides are disabled. This options can be used to use only position fixes with a minimum number of satellites in view to ensure accuracy. For a valid 2D fix, at least 3 satellites are required, for a 3D fix, you need at least 4 satellites. It is recommended to set this value to 6 or higher. For RTK at least 5 satellites are required. Activates alarm when the HDOP (Horizontal Dilution of Precision) value exceeds a defined threshold. Recommended value is 2.0. The DGPS age indicates the age of the correction data in seconds. When this value goes up, it often means that the differential GPS or RTK correction signal is temporary lost. In most scenario's this value will not exceed the value of 5-6. It is recommended to set this value to 10. 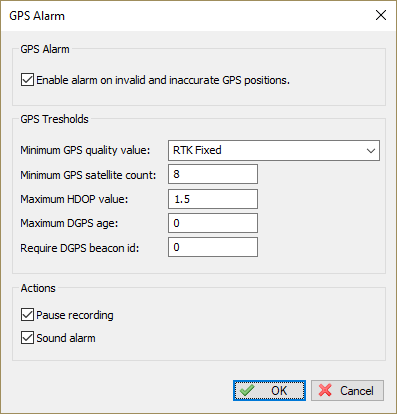 This option can be used when a DGPS or RTK correction signal is used. When another beacon is received then the one that is expected, it may result in inaccurate positions, for instance when a reference station is at a to great distance. Set this value to the beacon ID that is displayed directly at a successful setup of your reference station. 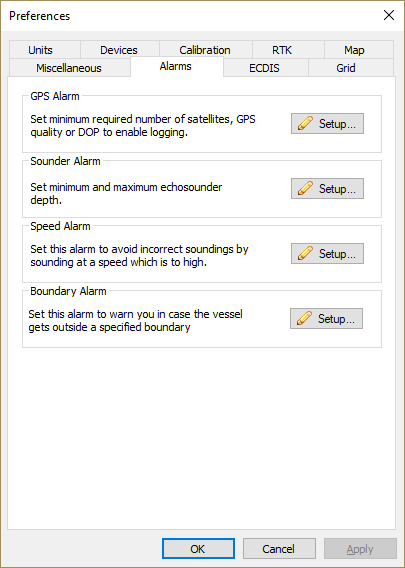 To setup alarms on the echo sounder equipment, click the "Setup..." button in the "Sounder Alarm" section. Sounder alarms are available in the Hydromagic Survey edition only. 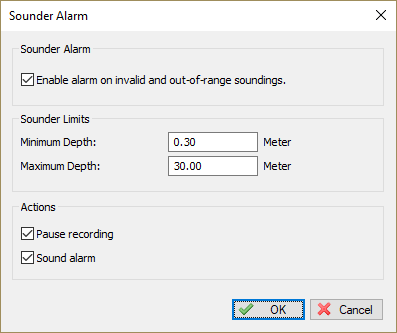 To enable alarms for sounders, check the "Enable alarm on invalid and out-of-range soundings" option. Sets the minimum depth that is expected to be returned from the sounder. This value is not corrected, but compared to the raw depth returned. Sets the maximum depth that is expected to be returned from the sounder. To setup an alarm on an area boundary, click the "Setup..." button in the "Boundary Alarm" section. 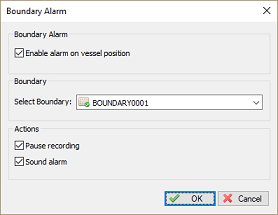 To enable an alarm for boundaries, check the "Enable alarm on vessel position" option. The selected boundary is used to check the vessel position. When the vessel is outside of the selected boundary, the alarm will be triggered. To setup an alarm on the speed of the vessel, click the "Setup..." button in the "Speed Alarm" section. To enable an alarm for speed, check the "Enable alarm on speed limit" option. 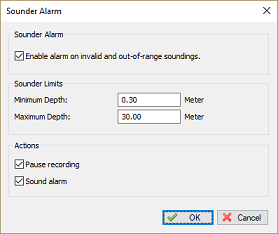 When the "Pause sounding recording" option is enabled, the recording of the current sounding is suspended when the alarm is activated. You have to press the record button again to resume recording. When the "Sound alarm" option is enabled, then a sound is played when the alarm is activated. In addition to the sound, a big red banner with the text 'ALARM' is displayed in the map view. 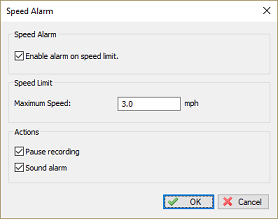 NOTE: When using sound alarm(s), make sure your sound hardware is enabled and the volume is turned on.